After many months of training indoors and low land riding, I finally got back to some Mountain Quest trekking. 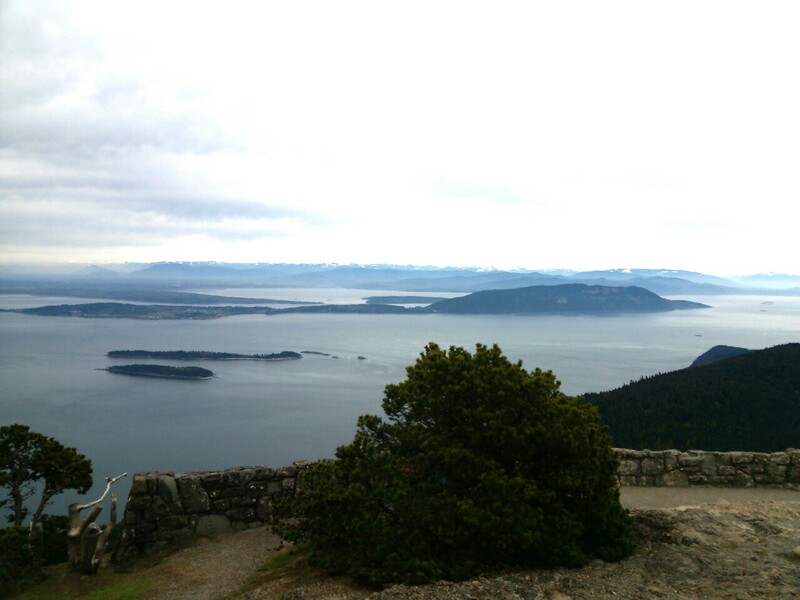 I headed back to the San Juan Islands to cross another mountain off of the bucket list. The Anacortes ferry took me to Orcas Island where I began the ride. There were many other cyclists on the ferry. They were all headed to Lopez Island for the Tour De Lopez event that would start the next day. This is a family style event that supports bike riding and sounded like a lot of fun. I will have to put it on my list of things to do next year as I have other plans for Saturday. I exited the ferry and was soon touring through the countryside. Fields of sheep, cows, and a few deer kept me company as I rode on. I made a short stop in Eastsound to get some food as it would be the last chance before hitting the hill. 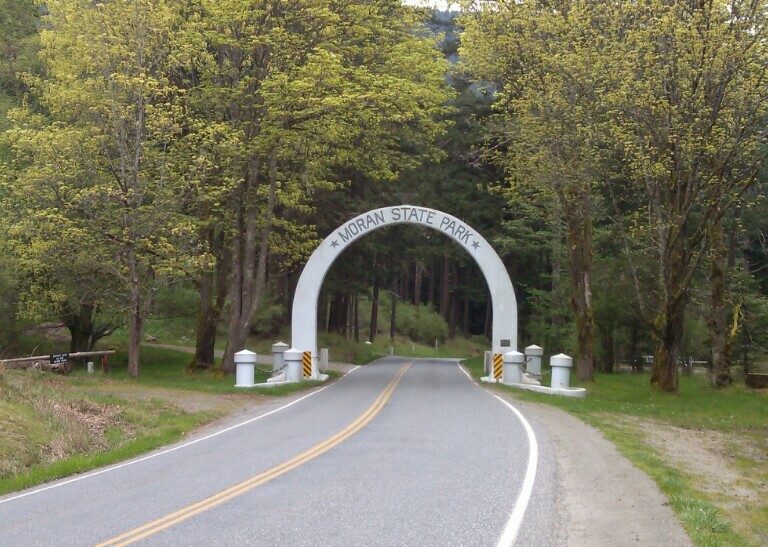 I entered the Moran State Park and saw the road grade increase. Many people were enjoying this beautiful park. It was a very scenic ride with Cascade Lake to my side. I took note of a few road hazards as I started my climb up the mountain. Some of the corners with potholes and road debris could surely ruin my day on the way back down if not avoided. 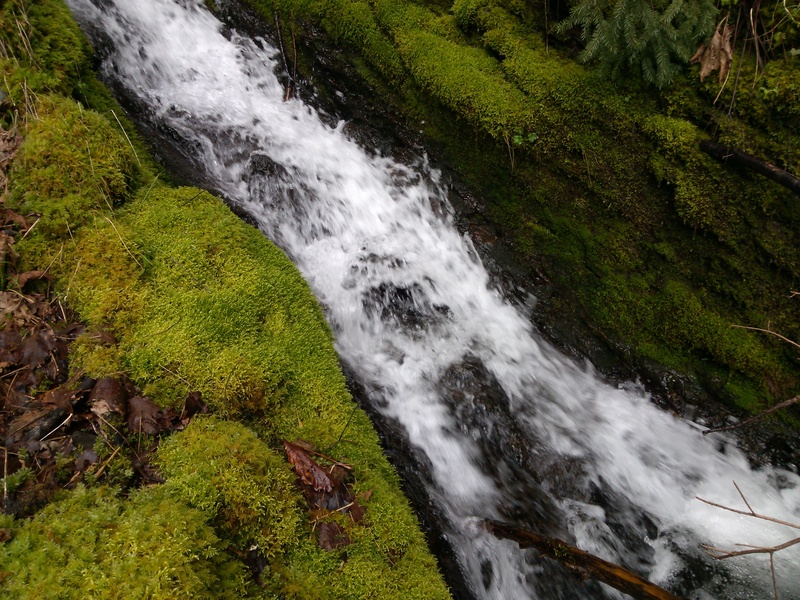 I stopped to enjoy the mountain stream on my way up. I tackled the biggest chunk of elevation gain for this ride. There are approximately 5.5 miles of road that climbs up the last 1,500 feet. I seldom saw any gear on my bike but 1st and 2nd for this section of road. I made it to the top and realized immediately it was well worth the grind. Even on this cloudy day the view was incredible. Mt. Baker and the snow capped Cascade Mountains were beautiful. There is an observation tower that looks like something from Medieval times. 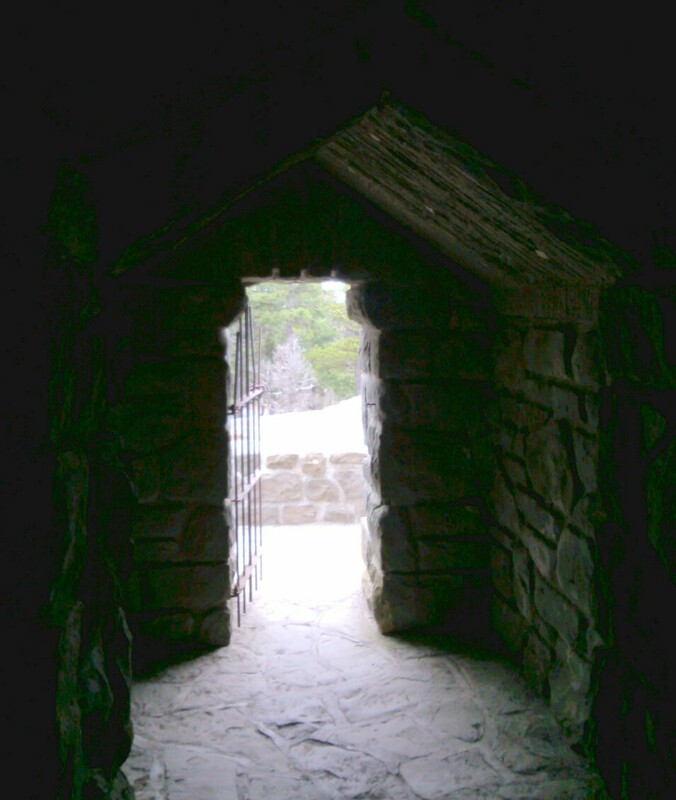 I took a photo from inside the tower doorway and adjusted the highlights to bring out the moss that covered the rock walls. It was a bit cold up on top so my stay was short. After a brief photo session, I bundled up and headed down the mountain. I bulleted down the road only touching the brakes on a couple of the tightest of corners. What a rush! I realized I would have to really push myself on the way back if I were to make the ferry boat ride I wanted. For the next hour it was pedal to the max. I rolled into the ferry line three minutes before boarding. I was winded and wiped out from the day’s ride but felt a sense of satisfaction for accomplishing the day’s events. This ride was the first step in preparing for the July Pike’s Peak, Colorado ride that awaits me. My mission for the next two months will be to take my body to the limit in preparation for the ride of a lifetime. 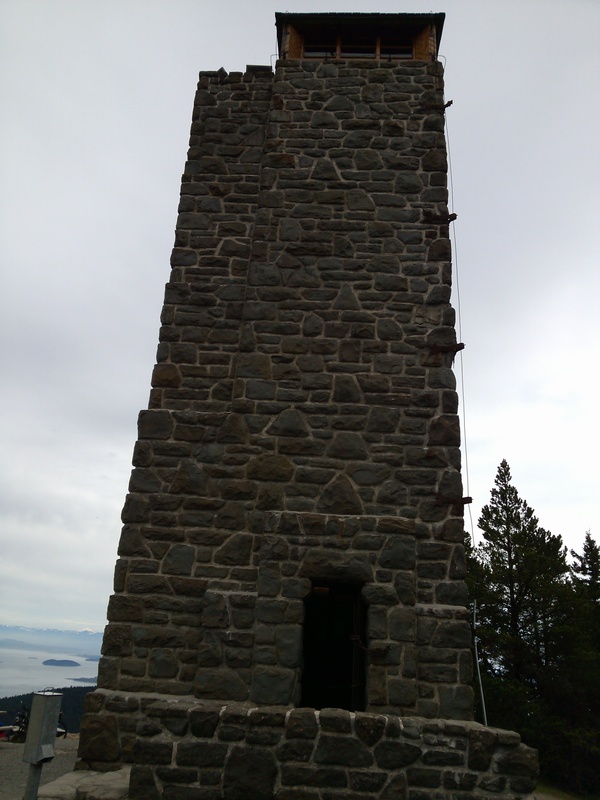 I recommend this Mt Constitution ride to all as I believe you too will enjoy it as much as I. Thanks for joining me and until next time….Carpe Diem. 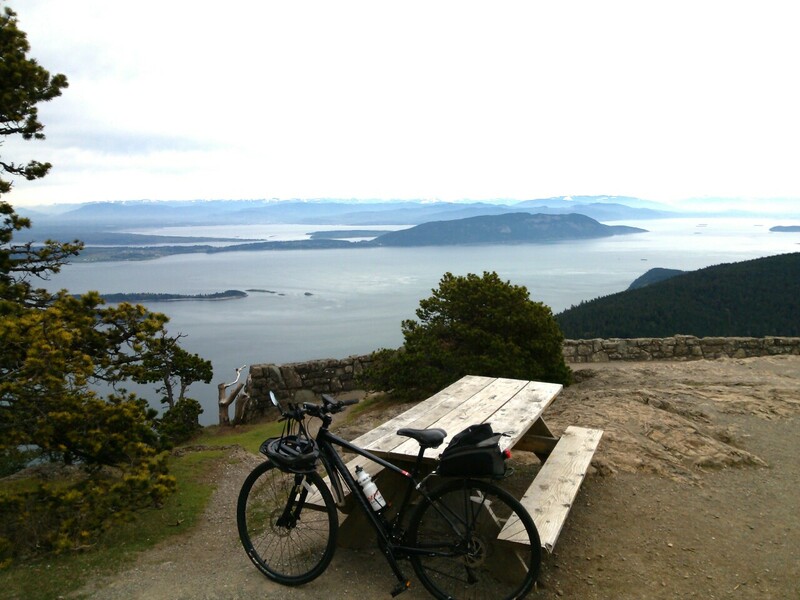 This entry was posted in Bicycling, Ferry, Mount Constitution, Mountains, Orcas Island, Photography, San Juan Islands, Washington State, Washington State Parks. Bookmark the permalink. Love that mountain stream shot! What’s entails the July’s Pike Peak run? p.s Thanks for being such a fan of my posts! :) Cosmic hugs to you! The Pike’s Peak ride will be the crown jewel of rides for me on this continent. It is the highest paved road in North America. It starts over 7,000 feet and goes to over 14,000 feet. 19 miles of reach down within to see what my body can endure. Thank you for following and for making us look to the universe within. I only wish the photos could capture the real beauty. It is breathtaking.